Zultys' Enterprise class IP phone systems combine best-of-breed integrated voice, data, conferencing and Unified Communications services into one efficient appliance. Based on Linux and open SIP (Session Initiation Protocol) standards, Zultys IP phone systems come pre-installed with a full suite of business enhancing features that provide enterprise-class voice, Unified Communications, mobility and contact center services. Zultys IP phone systems are easy to install and maintain because of their award-winning "All-in-One" design, and can easily scale from small offices to global enterprise systems that support thousands of users through a highly survivable distributed network. Zultys IP phone systems are supported by survivable gateway and Analog-SIP gateway products. 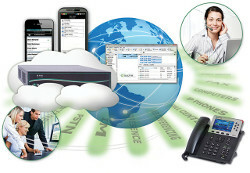 The MX250 IP phone system is a feature-rich enterprise-class business IP telephony system that supports high quality VoIP and Unified Communications services for up to 250 users on a single appliance and can be seamlessly expanded through an MXnetwork to support up to 10,000 users and 128 offices across an enterprise-wide Unified Communications system.